ZìKǎ ( 字卡 ) is a program for helping to learn the Chinese vocabulary introduced in various textbooks currently and previously used in Chinese language courses at the University of Vermont and other schools. Written in Java, it will work with any operating system (Mac, Windows, Linux) with an installed Java runtime environment (version 5 [J2SE 5 or 1.5] or later). It will not run on Android or iOS tablets. Here are some screenshots of the Words tab and List tab. Chinese Zika was mainly intended to be used along with certain textbooks whose vocabulary is included. It could be used on its own, though, in learning basic vocabulary. 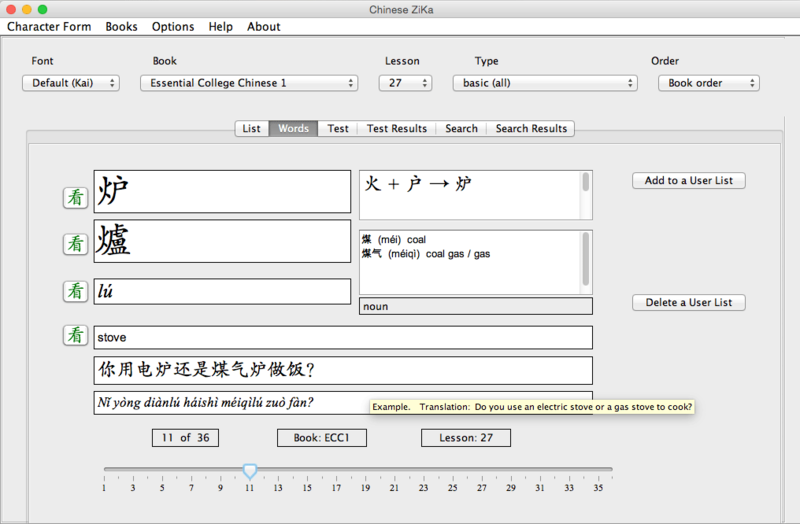 Zika allows you to form and save your own lists of words from individual lessons or groups of lessons from various textbooks and display them for study in many different ways, including viewing them in a number of different Chinese fonts that are installed on your computer as well as the installed default Kai font. In order for ZiKa to be more portable (such as keeping it on your USB Flash drive so that you can use it on other computers wherever you go), all user interaction is contained within the program itself -- except for files you explicitly save (Test Results) to another location. Four different tests are available: Pinyin, Tone, Character, and English, according to what the user has to make the correct choice for. If desired, the results of multiple tests can be saved to the Test Results tab, where selected results can be printed or saved to a file, which could then be sent to an instructor. The program uses the word lists from the included books. 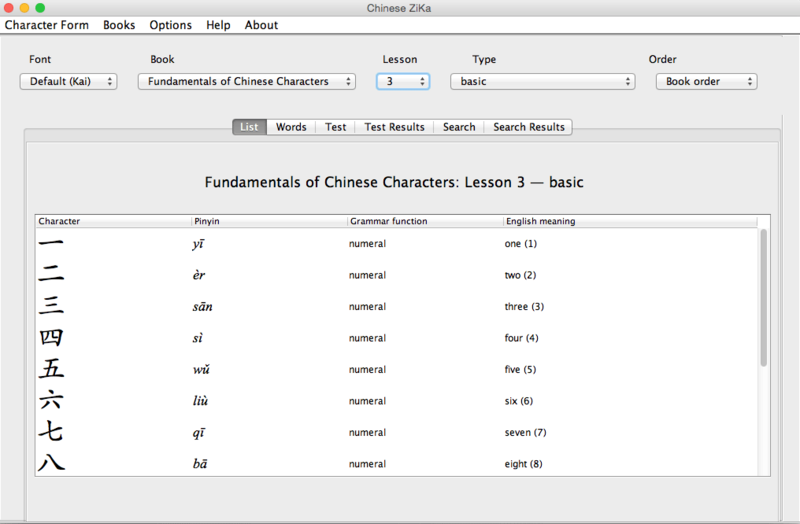 There is also a companion program ZikiEditor which can be used to make word lists from any Chinese textbook. Word list updates or corrections can be sent to students to be imported into their Zika program. Please contact the author about ZikiEditor.